Scitec Nutrition launches the all-new 2016 Edition of its top-selling whey protein. Scitec Nutrition 100% Whey Professional v2.0 is now with 30g protein per serving- the highest protein content per serving in its class. More Protein = More Muscle. 30g of 100% Whey Protein per serving: Now with 30g protein per serving, it provides the highest protein content per serving in its class. Whey Isolates – Primary Source: Contains a high quality, fast-acting Cross Flow Microfiltered Whey Isolate as the Primary Source. Intact Microfractions: Intact protein Microfractions from premium Whey Concentrates are equally important and are a source of essential amino acids, as well as large amounts of quality BCAAs, immunity boosters, and antioxidants. Digestive Enzyme Blend: Digestive enzyme complex added for efficient digestion and utilization of protein. · Protein requirement for a sedentary individual is 0.8-1g/kg body weight. However for an exercising individual the requirement increases upto 1.5-2g/kg body weight depending on activity levels. · Mix 1 serving (41g) in 300 ml of water. Shake vigorously for 30secs for smoothest consistency. · For a better protein shake use room temperature water. The colder the water, the more the protein coagulates and makes a thicker shake. · To avoid powder getting stuck to the shaker, add water first and then add protein to water. · The ideal times to consume Scitec Nutrition 100% Whey Professional are, first thing in the morning and post-workout, so as to stop catabolism (breakdown of muscle) and kick start anabolism (muscle synthesis) respectively. Apart from the above mentioned times Scitec Nutrition 100% Professional Whey can also be consumed with/in-between meals to meet up daily protein requirement. Q.1 What is Scitec Nutrition 100% Whey Professional? 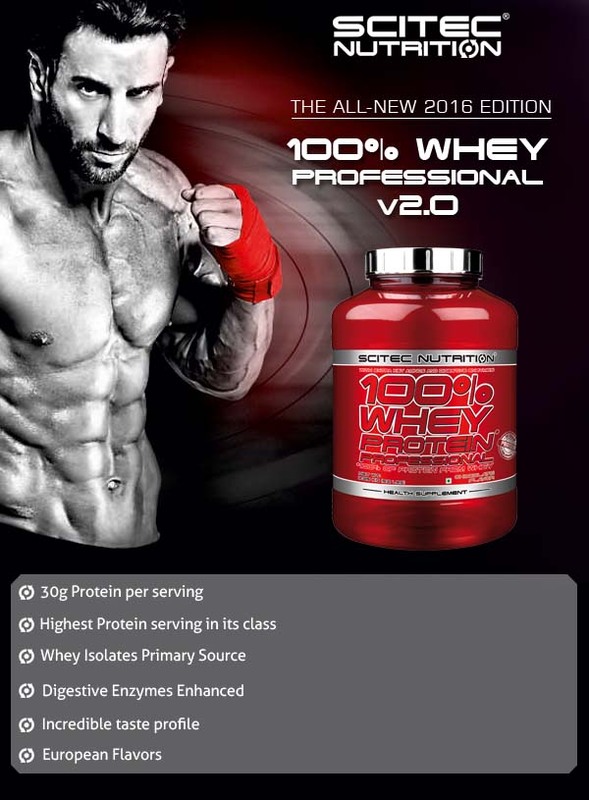 Scitec Nutrition 100% Whey Professional contains a huge 30g of high-quality protein powder loaded with whey protein isolates along with the whey concentrates and intact immunoglobin protein fractions. With added amino matrix and digestive enzyme blend, Scitec Nutrition 100% Whey Professional is an excellent choice of protein for muscle building, anti-catabolism and speeding recovery. Q.2 What are Whey Protein Isolates? Whey Protein Isolate has a higher percentage of proteins which rounds to almost 80-90%. Higher concentration of protein is the result of the processing it undergoes i.e. either Cross flow Micro-filtration and Ion- Exchange. These processes help to separate protein from lactose, fats, ash and minerals. Of both these processes, Cross flow Micro-filtration is superior filtration process as compared to Ion Exchange as it keeps the whey microfractions intact. Whey Isolate has minimum amount of lactose, fats, ash and minerals in comparison to Whey Protein Concentrates. Whey Protein Isolate is a fast acting protein and the body digests it within 30 minutes of consumption. This property to digest fast helps to repair damaged muscle tissue and aids in faster recovery. As Whey Isolates have much lower amount of lactose than Whey concentrates, it becomes a great choice for lactose sensitive individuals. Q.3 What is Whey Protein Concentrate? Whey protein concentrate is one of the most popular and cost-effective forms of whey protein. It has between 34% and 80% protein depending upon the extent of filtration and end use. As protein percentage increases, the lactose percentage proportionately decreases. Q.4 What is the ideal time to consume Scitec Nutrition 100% Whey Professional? The ideal times to consume it is first thing in the morning and post-workout, so as to stop catabolism (breakdown of muscle) and kick start anabolism (muscle synthesis) respectively. Apart from above mentioned times Scitec Nutrition 100% Whey Professional can also be consumed with/in-between meals to meet up daily protein requirement. Q.5 Since Scitec Nutrition 100% Whey Professional is a protein derived from milk, why cant we simply have milk/ or consume it through diet? 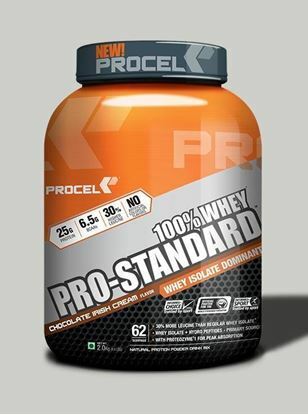 Q.6 Will Scitec Nutrition 100% Whey Professional cause weight gain? Q.7 Since Scitec Nutrition 100% Whey Professional is protein powder do I still need it if I eat chicken, fish on a daily basis? Q.8 Should I consume Scitec Nutrition 100% Whey Professional in Milk or water?